You must be a member of the Mombasa City Trotters Group to attend this activity. Would you like to join this group? We used to play Volleyball every Wednesday on this very beautiful beach at Nyali Sun Africa Hotel (Former Nyali Intertnational Beach Hotel). I don’t know why it just got stopped. Well nevertheless, let’s start it again. 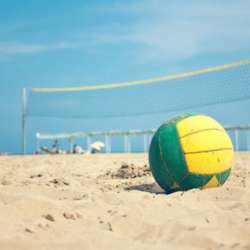 Let’s meet every Wednesday on this beach bar, let’s get a little sandy, let’s loosen up a little kallories and most importantly let’s have some volley fun on the beach. I want to make it a regular thing for every week, eventually we can make it but let’s start it first. I hope and really wish if we can do it. So i’ll See you guys on the beach with the volley, let’s who got it best.